Why Is My Business Page Losing Instagram Followers? Instagram popularity has soared in just a few short years. With nearly 100 million active users, they’re second only to Facebook. They may soon overtake it. With an audience like this, there’s no reason you should be losing Instagram followers. That is unless you’re making some fatal mistakes. What’s killing your brand’s Instagram account? The reasons aren’t as mysterious as they may seem. Instagram is a powerful lead-generating tool. That’s why you’re using it for your small business in the first place. But some small businesses don’t understand how to turn followers into customers. They’re wasting their social media marketing budget. They think it will pay off eventually just because “social media works”. They’re losing Instagram followers and potential customers in the process. That’s not a functional social media strategy. There are two main ways that businesses turn engagement into leads on Instagram, lead ads and the bio link. These offer something to your target customer in exchange for submitting their contact info. These go out throughout the Instagram and Facebook community. You’re not limited to just the people following your account. Nurture that lead through email and other, more personalized means to get a paying customer. Leads ads do cost money. But studies show they can earn up to 5X the leads for 85% less than other similar lead-generation methods. Engaging customers both on and off Instagram will help you stop losing Instagram followers. Many small business Instagram accounts don’t effectively drive traffic to their website. The Instagram community generates over 1,000 comments per second. It’s one of the most active social communities today. When this many people are viewing content, people want to know who’s providing that content. But Instagram prohibits you from directly linking to a page in your post. They’ll click on your bio to find out who you are. They need somewhere to go to continue their journey. Your website is the next logical step. Look at 5 studies from reputable social media research firms. You’ll get 5 different answers on what the ideal frequency is. Research from Buffer showed that the average large company is posting around 1.5/day. Another study showed that 3 times a day is ideal. Another demonstrated that 10 got the best return on your time. To this inconsistency, we would say that the variance is due to the studies measuring different audiences and brand styles. You’ll need to delve into Instagram analytics to see how frequencies impact your engagement rates and net follower gain/loss. The most important thing is consistency and quality. You’re a busy small business leader. You work all week at your “regular job” and then post 20 “catch-up” images and videos on a Saturday. It seems like it should all be the same, but it isn’t. You won’t be able to gain traction. People will forget about you in the middle. You should be posting at least 1-2 images a day. You don’t need to post every hour like they recommend on Twitter. Find that perfect balance by listening to your followers through analytics. What would happen if you were selling your home and put blurry, pixelated images up on the website? It wouldn’t matter what you said about that amazing backyard, the spacious bonus room, and immaculate kitchen. The images would overshadow everything. People on Instagram want to be inspired in some way. It could be a new design idea, a cause or something that makes them laugh. Whatever it is, poorly lit, grainy images don’t inspire. They don’t earn followers. You’re losing Instagram followers because of it. They demonstrate that you don’t care. Fortunately, in the case of this Instagram photo, they are going for the #blurry look. You’re brand probably shouldn’t. Take pictures and video with a high-quality camera or smartphone. Don’t do sloppy crop and enlarge jobs. Under-expose your shots. Lighten them in editing if needed. Professionals do this because it doesn’t work the other way around. This is how they get those stunning pictures that everyone loves. Pay attention to composition. What’s in the photo? How are things arranged? Avoid clutter. Less is more. Give the eye an instant focal point. Take the photo from different angles then choose the best one. It can completely transform a shot. With practice, you’ll know which angle is best. Professionals would never just take one shot and assume it will be perfect. Choose a palette. An Instagram account will stand out and draw more interest if the photos have a similar color scheme, theme or signature. Hire a professional photographer for a day. Plan well so that a lot can be accomplished. You’ll have most of your pictures for 6 months done in one day. Because they’re done by one photographer, they’ll have a signature look that will catch attention. Finally, avoid #photoshopfails like this one… unless they somehow further your brand. This isn’t your personal Instagram account. People don’t care that your dog had a birthday or that you just got back from vacation. That is unless this is clearly a part of your brand personality. When people see random, unexpected posts, they think they’ve followed the wrong account. That’s how many businesses are losing Instagram followers fast. You can often instantly see the follower number go down after posting things like this. You may be really tempted to post these cute and possibly ill-fated kitties. But first, think about how this works into your brand strategy. What worked last year, or even last month, may no longer be relevant to your followers. Your brand should stay consistent and follow a plan. But what you post on a daily basis should align with current industry and consumer trends. Are you pushing products that people don’t want just to dump inventory? That’s bad for your brand in the long-term. Are you still talking about yesterday’s news through your images? You’re losing Instagram followers. They’re looking for someone who’s in tune with their industry and customers. These are also called Customer Avatars and other names, depending on who you ask. If you haven’t created a buyer persona that represents your target customer, it’s time to start. This will help you across all social media platforms and other marketing channels. A well thought out buyer persona should be thought of as a real person. It’s the ideal person you strive to reach as a brand. When possible, use real customer data to fill out who your target customer is. Create data-driven personas. Use surveys, hard data, salesperson knowledge, market analysis and other information. Give the persona a name that represents a major characteristic you need to target (eg. Thrifty Tony, Busy Erica, etc.) The characteristic should be something you want to target. For example, if you sell high-end watches, Tony’s thriftiness isn’t likely a trait you’d target. If your company saves people money by helping them DIY, then Tony’s thriftiness is a great trait to target. Give your persona a face. Find a free picture online. As you prepare your Instagram posts and stories, think about which persona this post is for. Tap into the persona’s challenges, emotions, and goals. Be the place that this person comes for entertainment and/or information. This will allow you to connect on a much deeper level. Become a brand that they come back to again and again. Is your answer: I don’t know? Then you’re losing Instagram followers who want to be a part of a brand like yours. They’re going to the brand that gives them the social media experience they’re looking for. Who is my Instagram competition? Are you asking this question? Then things may be even worse than you think. A brand isn’t an island. It exists in a world of brand influences. If you don’t know what those influences are, you’re losing Instagram followers. Let’s look briefly at how to do an Instagram Competitive Analysis. On Instagram, there’s no such thing as a captive audience. It’s not like attending a business conference. Your potential customers aren’t forced to sit through your pitch where they realize you’re amazing after the first 5-10 minutes. You have 7 seconds or less to make a first visual impression with your Instagram account. If you’re not effectively engaging people, you’re losing Instagram followers. Have your personas in hand. Use them as a guide to understand who the true competition is. Go through your personas one by one. Ask yourself which brands will this persona like. If you can use a survey to acquire more solid information, do it. If you’re a local business, keep in mind, your Instagram competition may not be local. They may not even be direct competitors. Do they share similar information? They’re a potential competitor. Dentists may be competing with toothbrush companies and teeth whiteners. Be realistic about who’s really competing for your target customer’s time in your space. But don’t overwhelm yourself. You can’t possibly analyze every competitor. Pick a top 5. Branch out if needed later. Create a worksheet for each. Answer these questions. Make note of anything else that stands out. How is the bio structured? This is more important on Instagram than any other platform because there are no post links. What’s so great about their profile image? Does it inspire? Does it make people curious? What’s its appeal? How do they speak? Like a friend, professional, use slang, etc.? What’s their primary color pallette? Gray, white and neutral? Pastels? Bold and contrasting? What kinds of captions do they use? How do they respond to comments? Which posts get the most engagement? Look for similarities among these top brands that suggest an industry best practice. Consider what takeaways would translate to your brand. Never copy. Get inspired by what works. Adapt what you’ve learned to your own brand and style. Whatever they’re doing, do it better. Of course, you want Instagram to increase your revenues. That’s your ultimate goal. But if you’re so focused on that one goal, you won’t take the necessary steps to get there. You wouldn’t climb the stairs 8 steps at a time. You take each step to achieve your big goal. In marketing, each step is its own goal or objective. Your goals are the nucleus of everything you do. Are you “playing around” with your business Instagram account because you don’t have clear goals? You’re losing Instagram followers. Trying to meet many goals at once will dilute your efforts and “turn off” followers. Not setting effective goals makes Instagram look like it’s not worth your time. But with goal-driven, highly visual strategies, brands get results. 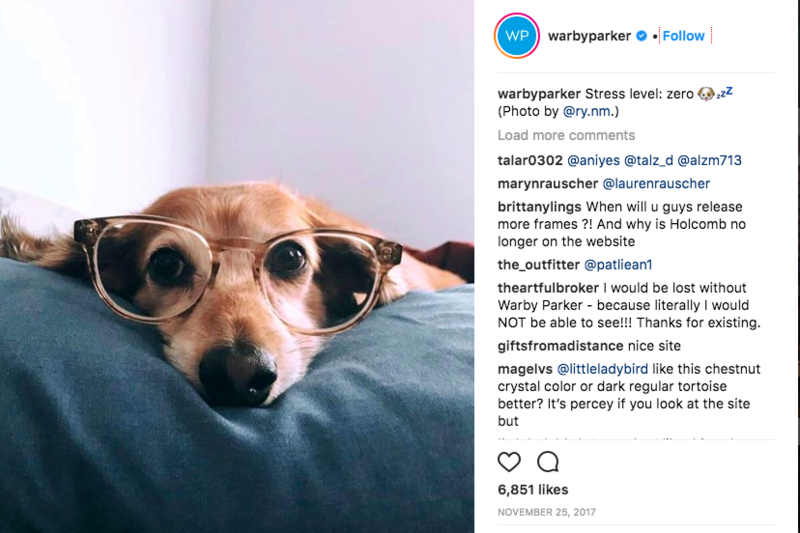 Take Warby Parker, for example. Just a few years ago no one had heard of them. Today they’re changing how people buy prescription glasses. They’re using relevant, highly shareable images to increase brand awareness. They’re creating a brand that people love around an item that is a necessity to most. They’re not asking you to buy anything. 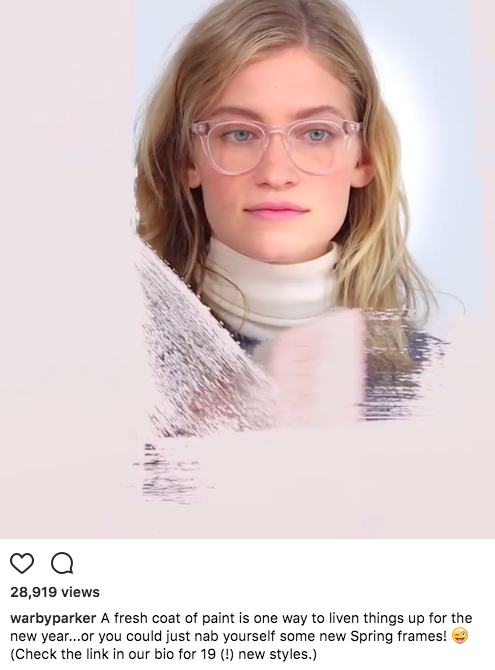 But it’s very clear from their page that they sell glasses. Let’s look at some common Instagram goals and how you would build a strategy around them. Being highly visible is your number one priority. During this stage, you should make an extra effort to put your best face forward. That means that every photo should be highest quality. Your page should look like a themed gallery that represents your brand. Your captions should be entertaining and/or informative. You can’t drive traffic without awareness first. Once your Instagram followers list begins to grow, it’s time to turn that awareness into traffic for your website. To do this, you need compelling copy and clear calls to action. 5-10 or more landing pages should await the clickers on your site to further the buyer’s journey. Some small businesses make their Instagram private. They treat it like a special club. They want it to feel exclusive. People have to be accepted to get access to the valuable content they share. If you’re doing this, you’re losing Instagram followers before you gain them. This is like decorating your office with inspiring images and then never turning the lights on. With the exception of some coveted, high-value reports or studies, content is most valuable to you when it’s freely shared. Increase brand awareness. Build trust. Nurture leads. Increase revenues. Grow your business by sharing who you are for all to see. Social media may seem one-sided at times. But it’s a highly social activity. People comment. Others comment back. Sometimes they’re bored. Often they’re really looking for some human interaction. They want to feel connected and appreciated. They want to feel like they’re a part of your brand. They want to know you’re there on the other side of that Instagram account. When you interact you get more comments, build trust and demonstrate that people can trust your brand. Think of a commenter as a “warm lead”. Nurture this warm lead. Turn it into a highly qualified one. Ignore those warm leads and you’re losing Instagram followers who are most likely to become customers. Set aside some time each day to interact. You can do this in several ways. Thank people for their comments. If you get a ton of comments, you can do this per post. Don’t forget to include their Instagram handle to ensure they see the comment. Followers do what again? They follow you. They can see what you post today, and yesterday and last week. They remember if you posted this already. Maybe you’ve been playing the traditional marketing game for too long. You may think that annoying people with repetition is the way to increase revenues. That was the case when entertainment choices were limited to a handful of TV stations. Social media doesn’t work that way. People have many other options and many brands competing for their attention. 70% of Instagram users say they’re on Instagram to learn about new brands and new offerings of brands they follow. If you’re constantly showing the same stuff, it will appear that your inventory never changes. You don’t re-evaluate and adapt to changing customer need. Keep things fresh. Limit re-posts. When you think about people abusing hashtags, Twitter usually comes to mind. You can always tell when the poster is really reaching. The more hashtags you have the less relevant the post seems. An Instagram follower wonders if you really know who this post is intended for. Hashtags are incredibly important. That’s one of the ways you increase brand awareness — especially is early stages. Follow these smart hashtag rules to avoid Hashtag faux pas. Remember what hashtags are for. They’re so people find your post when they search that hashtag. Unless you’re trying to start a movement, making one up doesn’t normally make sense. Use the same ones across platforms and posts. This increases the chance that the same person sees you again and again in different context. They’ll see you as a voice on that hashtag. Use relevant tags. Loosely relevant tags will generate views with low engagement. Use up to 11. Go over this and it’s hard to still be relevant. Studies have shown that a sweet spot appears around 8-11. Research what the competition is using. Consider how the hashtag is used. Some hashtags may see relevant but are directly connected to a movement. Check the hashtags out. Avoid an embarrassing mistake. It’s pretty easy to get carried away with Instagram. If you have a personal account, you know how much fun it can be. But if you’re not paying attention to the numbers, Instagram will just be a hobby for your business. You won’t see a return on your investment. Ignoring analytics? You’re losing Instagram followers because of it. You’re certainly not getting new customers through it. Frequency — How does it impact your other numbers? Audience — Are you reaching people who are potential customers? Best posting times — When do you get the most engagement? Review this data regularly. Continue to improve your Instagram presence. You’ll be amazed what you learn about your customers. This will translate to other platforms. You’ll create a better overall social media marketing strategy. Are you still losing Instagram followers? Stop it by following these tips. Be amazed by the difference a goal-driven strategy and effective execution make. Get more out of Instagram and all of your marketing efforts. Stop wasting time on ineffective strategies. Grow your business instead with a social media marketing company. We can help. Contact us today!